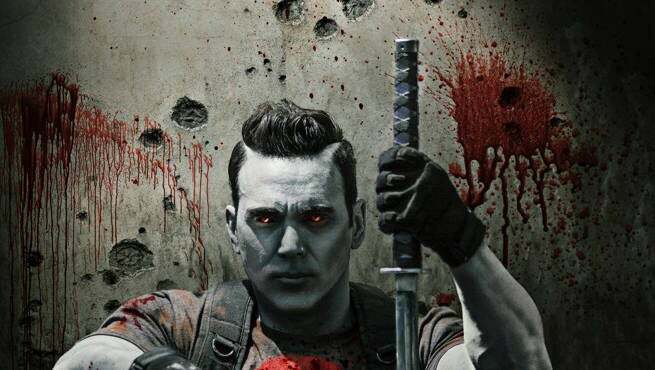 Ever since Valiant Entertainment first mentioned that they were producing a top secret series with Bat in the Sun, fans have been eager to see what a Jason David Frank as Bloodshot would end up looking like. Now fans have their answer, as they've released a first look at their version of the character, and it's awfully impressive. The image is the special variant edition of Bloodshot #14, and the Top-Secret Project Jason David Frank Variant will be free at his signing session on Friday, October 7th. "We've set out to make the best and most ambitious series ever produced in the digital space – one that will live up to the high standards we've set in publishing," said Valiant CEO & Chief Creative Officer Dinesh Shamdasani. "As Valiant gears up for an upcoming slate of film, television and video game releases, we felt the timing was right to begin to produce live-action digital content that would both give ours fans an experience truly worthy of the Valiant Universe, while also introducing new fans to the Valiant characters in the same way the animated television shows of the 1980s and 1990s did for comics in years past. Get ready to lose your mind – seeing Ninjak in action for the first time in nothing short of incredible." This is the second reveal from the top secret series, as earlier this week they released the first look at Michael Rowe's Ninjak. You can view the variant cover in the gallery, and if you happen to be at NYCC this year you can pick up the variant at the Valiant booth #1635.